I love See’s Candy. I was a sugar restricted kid that looked forward to the holidays every year so I could get my three pieces of See’s candy from the 2 pound box. (I have a big family). I grew up studying and mapping out the candy box so that none of my precious chocolate selections would be duds. Here are some tips I’ve learned over my See’s Candy eating lifetime. Choose the right box. If you’re not custom making your box of candy then you will probably be choosing from two options. The Assorted Box or the Nut and Chew Box. Be careful with this choice because in the shiny, sweet smelling store your mouth will water at the thought of delicious chocolate covered nuts and chewy caramel deliciousness. But you have to realize that half the selection of Nuts and Chews are going to be dark chocolate peanut and almond clusters and half dipped dried out almond and walnut caramels. They’ll be left sliding around in the box until they’re finally thrown out a week after Christmas. 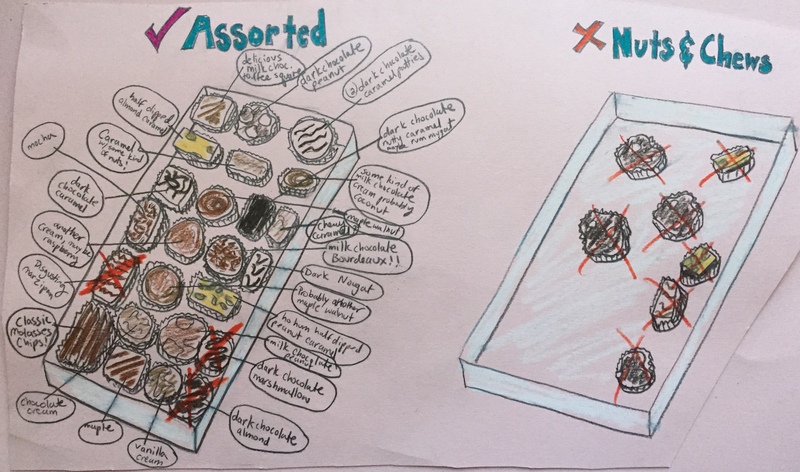 So, obviously the correct choice is the Assorted Box. It’s not perfect but there are a lot of See’s very best in that box. Like the Bourdeaux, Mocha, Caramels, Toffee Squares and the classic, Milk Chocolate Molasses Chips. There are a few that I recommend you throw right into the trash the second you open the box. These are the disgusting Marzipan, super gross Rum Caramel Nut Cherry thing, and the ho hum and kind of weird Dark Chocolate Marshmallow. In conclusion, go run out there, buy yourself an Assorted and then go enjoy the holiday magic of the roller coaster ride that I like to call The Sugar High.